We have our wedding invitations! Above is a photo of the book from which we chose our invitation. I took a photo to show how large these invitation books are. 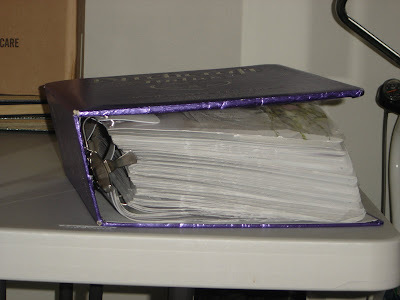 Imagine 50 or so of these binders awaiting your viewing pleasure. I confess to spending some time oohhhing and aahhhing over some gorgeous invitations. I confess to coveting some of those nicer (pricier) gorgeous designs. And then my practical side took over. We agreed on a small, simple wedding. Nothing large. Nothing exceptionally lavish. Keep costs down. All the little things add up (favors, pretty hair ornament, pew bows, unity candle, table decorations, programs, etc.). You need to figure out what the important things are and what the not so important things are. To us, food, wine, and cake are the important splurge things. Invitations, flowers, not so much. A $75 hair ornament from David's Bridal? No way, not for 5 hours of my life. In the end, my practical side chose one of the less expensive invitations. It was actually one of my more favorite designs, so it's not like I went with an ugly, plain, pick-the-cheapest one. After all, people are just going to throw them away. I'll save one, and maybe the moms will each save one, but otherwise, invitations are basically throwing your money in the trash (because that's where they'll end up). The only reason we didn't buy an invitation kit and print them ourselves is that we wanted to keep this whole wedding thing as stress free as possible and doing it ourselves, well, that could have been stressful. Is the printer set up correctly? Did it print centered? Is the toner smeared? Did it come out too light? Did the printer crinkle the invitation paper? Now I just need to address the invitations - this means I need to practice my calligraphy, something I haven't done in many, many years!! My ink cartridges are probably all dried out! Oh have fun! My sister and her fiance got theirs from Costco! You know, we didn't even think to check there! Costco! I never even thought of there! But I should have - they seem to have everything! We got ours at a Hallmark. Very, very nice lady there who handled the order.